This species, introduced from the European continent, is related to our native toothwort (Lathraea squamaria). 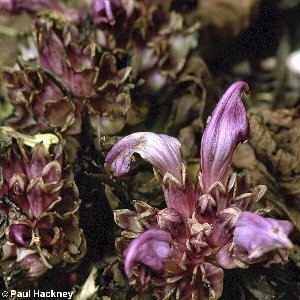 In Ireland the Purple Toothwort is only known from gardens where it was deliberately introduced. Like the native species it is a parasite of trees, usually willows. In summer, it produces very attractive bunches of red-purple from an underground stem. All names: Lathraea clandestina L.